New Zealand and China announced Monday they would open talks soon to expand a successful free-trade deal in place for nearly a decade. The announcement came during a visit by Chinese Premier Li Keqiang. New Zealand Prime Minister Bill English said the 9-year-old deal had been a huge success and resulted in trade between the countries tripling. He said an upgrade to the agreement would expand trade further, and that talks would begin next month. Li also praised the deal, saying it was the first that China had signed with a developed nation and remained the most advanced. He said the deal helps send a signal to the world. "It’s important to the peace and stability of the region and beyond," he said. New Zealand hopes that a renegotiated agreement would allow it to sell more dairy products to China, while China also hopes to sell more goods in New Zealand and erase a small trade deficit. The original deal imposes tariffs on certain New Zealand products sold in China after limits are reached. 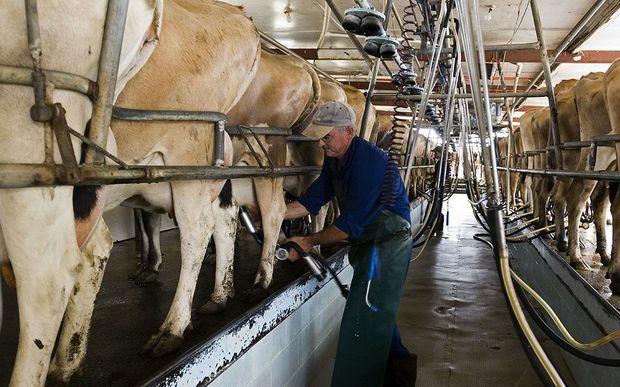 "One of the issues from New Zealand’s point of view is that the growth in trade has been so strong that some of the safeguard levels set back in 2008 are quite low levels, and the dairy industry has raised this issue with us," English said. The countries announced several other agreements, including one that allows chilled New Zealand meat to be exported to China under a six-month trial. China already accepts frozen sheep and beef meat. "This agreement has the potential to be worth hundreds of millions of dollars for our farmers, exporters and the wider economy," said New Zealand Trade Minister Todd McClay in a statement. Other agreements include an increase in the maximum number of direct flights allowed between the countries, a joint climate action plan, and strengthened cooperation on China’s "One Belt, One Road" program. The approach from China and New Zealand to free trade stands in contrast to that of the U.S., where President Donald Trump has pulled out of a planned Pacific free-trade agreement and has expressed skepticism about other such agreements. Li traveled to New Zealand after visiting Australia and is scheduled to stay until Wednesday.